CONET GmbH is a privately owned, well established full-service CRO (Contract Research Organization) headquartered in Mannheim, Germany, with a representative office in Moscow, Russia. 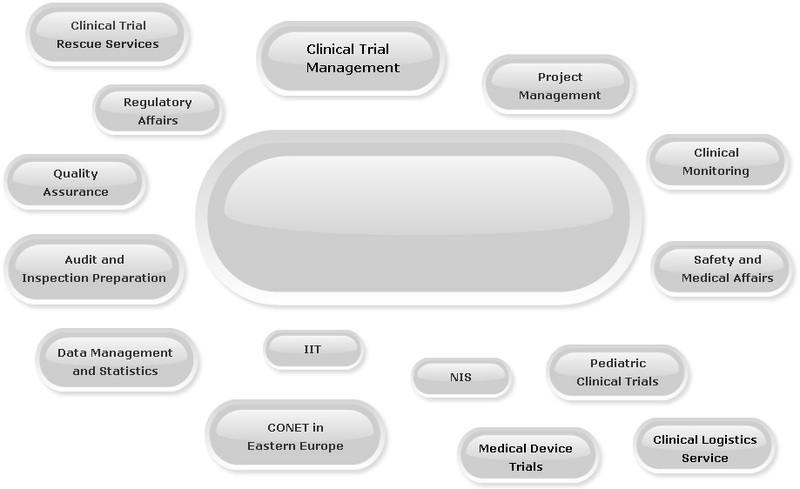 For more than 14 years, CONET offers clinical trial management service from small pilot studies to large multicenter international clinical trials for all phases (1-4), including pediatric clinical trials as well as IITs and medical device trials in accordance with EU Directives, internationally accepted guidelines and standards, like ICH-GCP or ISO EN 14155 and national laws. CONET operates in Western and Eastern European countries, including non-EU states like Russia and Ukraine. Multinational trials are centrally managed from our headquarters in Germany. CONET is committed to high quality, dedicated customer service, integrity and operational excellence. CONET provides a wide range of services in drug and medical device development. Depending on our client's specific needs we tailor full-service solutions or modular services towards a successful collaboration. CONET’s broad long-term experience in conducting clinical trials combined with our high quality standards enables us to offer clinical trial rescue services, especially regarding regulatory affairs, and rescue monitoring to help the sites participating in your study coming back on track. For CONET quality is the highest priority as it is the basis of our excellent reputation. Depending on needs, we offer system audits to verify performed processes as well as internal project audits geared towards improving our client’s internal quality standards. Co-monitoring activities are one of CONET's highest priority quality control tools, and are performed by our project managers and Lead CRAs. This ensures consistency of trial performance throughout the CRA team and allows potential problems to be identified at a very early stage. Co-monitoring is also offered to sponsor CRAs involved in other clinical trials to enhance and maintain quality. CONET is prepared to help you in difficult situations by providing support in preparation of regulatory authority or other governing body inspections as well as sponsor audits. Biostatistical and data processing services are offered by our established in-house partner STATIS GmbH. STATIS has demonstrated expertise in phase 2-4 clinical trials including diagnostics and medical device studies. CONET founded the representative office in Moscow more than 12 years ago recognizing the growing importance of Russia and the Russian speaking neighboring countries in the drug development market. Our dedicated and experienced team in Moscow is at your service. Although clinical trials in the Western and Eastern European countries are regulated through the EU directives, submission to local authorities, ethics committees and other bodies can be complex, as regulatory provisions can change. Our clients benefit from our well established contacts with regulatory authorities in various European countries. CONET will help researchers to manage the high demands placed on Investigator Initiated Trials offering the full range of services also provided for sponsor conducted clinical trials, like start-up services, all aspects regarding regulatory affairs, site management, clinical monitoring, quality assurance, data management and statistics. CONET has successfully managed phase 1-4 clinical trials in Western and Eastern Europe since 1998. Our service comprises the full scope of clinical trial management, from regulatory affairs, clinical logistics service, site monitoring, quality assurance, and drug safety, to data management, statistical analysis and preparation of the clinical study report. In non-interventional studies (NIS) already approved drugs are investigated under real life conditions to gain further information regarding safety and clinical effects in a large, non pre-selected patient population. CONET will assist you through the entire project. The enactment of the 4th Medical Device Act (4th MPG) in Germany brought a lot of changes for medical device product development. Medical devices must now be investigated similar to new drug clinical trials before they can achieve market approval. CONET’s knowledge of conducting clinical trials is at your disposal. CONET is offering customized solutions to reach your goals in developing your clinical research program. Our highly skilled project managers will keep your national and international clinical trials on track and moving forward by closely overseeing timelines and budget. Pediatric clinical trials are more complex and their ethical implications are more intricate compared to clinical trials for adults. CONET is a quality-driven company managing pediatric clinical trials with utmost care as we understand the special requirements for conducting pediatric clinical trials. All international monitoring activities are coordinated by one assigned Project Manager or Lead-CRA located in our headquarters in Mannheim, Germany, combining local expertise with professional management of the entire study monitoring team. As patient safety is of utmost importance in every clinical trial, the CONET safety team works in close collaboration with our clinical trial management and regulatory team to maintain an overall view of your project and ensure that safety is managed effectively and within timelines. Import of investigational medical products and study material into CEE countries can be a hurdle causing delays during study start-up and recruitment. CONET will procure the import/export licenses as well as the customs procedures and payments to facilitate a reliable and effective process throughout the study. CONET combines the advantages of an owner-managed company like flat hierarchy, short paths, personal responsibility and cost effectiveness. CONET is a reliable partner for global and nationally operating companies requiring either single service solutions for regulatory affairs, drug safety and medical affairs, project management, or clinical monitoring, or a full-service solution. Our team in Moscow provides local presence and expertise conducting clinical trials in Russia, in close cooperation with our headquarters in Mannheim. Our expertise is your access to local know-how!